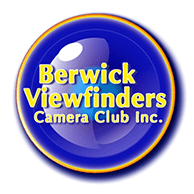 Berwick Viewfinders Camera Club Inc. Contacts - Berwick Viewfinders Camera Club Inc.
Berwick Viewfinders Camera Club Inc.
Meeting place:Monday Meetings. 112-116 High Street Berwick. Berwick Senior Citizens Club. Email: Contact or send images to current Web Administrators bpovey@me.com. (Barry P) or mlwharton@bigpond.com. (Mike W) or both.